In fresh plumage very distinctive with almost black velvety wings with a clear white fringe. However, as with other browns, the wings soon fade to a dark brown. The underwings, which are usually all that is seen when settled, are crossed by seven black eyespots with white pupils and yellow “halos” - unique in British butterflies. Very slow weak flight, butterfly appears black in flight. The flight period is from mid-June to July. 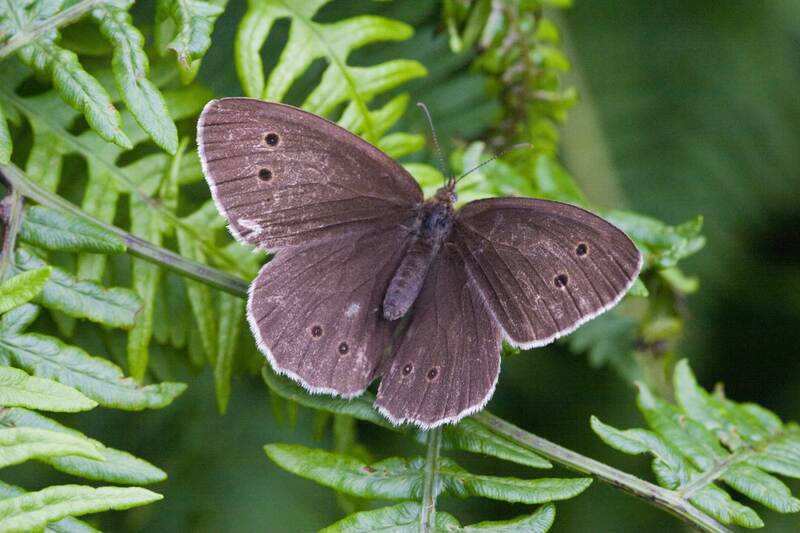 This species rapidly disappears and few are seen after early August. Woodland glades, edges and rides, country lanes with dense hedgerows, scrubby rank grassland. All over the county in suitable habitat, even in urban areas.